I have made no secret of the fact that I like both index investing and dividend growth investing, and use both to build my passive income and net worth. My series comparing the two can be found here. For international investing, I prefer indexing and ETFs mainly because of inconsistent disclosure norms, accounting standards and investor protection rules but I make exceptions for some excellent international companies. For many international companies, including those that pay dividends, there is no consistent policy for growing the dividends. But that is not necessarily bad. Many companies headquartered outside the U.S. follow a dividend policy more strongly tied to earnings, commonly limiting to a defined percentage of earnings. Since earnings often fluctuate, and even more so considering currency fluctuations against U.S. dollar, the dividends from international companies don’t follow a straight rising path. Still, that is no reason to shun them. Not so much if we look beyond just dividends. While dividend investing is a good way to secure your retirement income, it is important to remember that is not the only criteria that matters in investing. Where indexing beats dividend investing is in the sheer diversity of investments you can achieve in just one fund or ETF (like VTI or SPY). While some diversification can still mean “di-worsification”, the principle of owning as wide a range of high quality businesses as possible is a valid one. Just as you diversify across several sectors, it also helps to diversify even within a sector, where possible. We will see how you can apply the diversification principle using dividend investing. Telecommunications is one sector, which we will focus on this article. 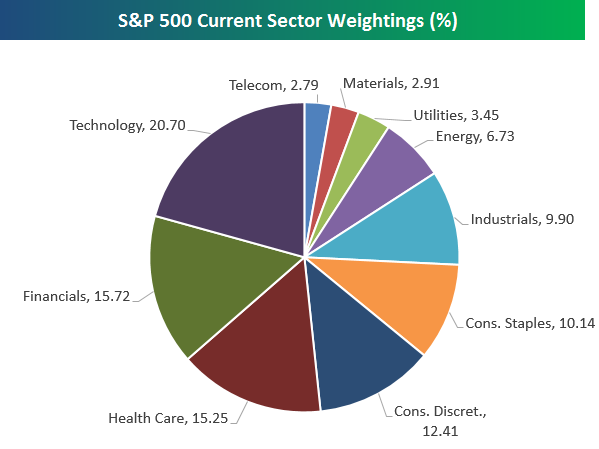 In S&P 500, the following chart shows the sector weightings. Note that the above chart doesn’t have equal weight in allocation across the ten sectors. That’s because it reflects which sectors dominate the economy more than others. In every country, the sector allocation of the market index will be different. In Canada, for example, their broad equity index is dominated by more than half with just two sectors – energy and financials. There is limited industry representation beyond that in Canada. It’s not about equality of sectors, but this does give a picture of the diversity of a country’s economy. U.S. is actually quite diverse in that respect, based on the chart above, and we also have the largest economy in the world. In constructing an investment portfolio based on dividends, even if you want to mirror the S&P 500 sector allocation, you are confronted with the question of what to own in a sector. You could own shares in just two major telecom companies in the U.S., AT&T (T) and Verizon (VZ), and you practically own the entire telecom sector of the U.S. Both companies are behemoths, offer juicy dividends, and have strong track records of dividend growth that keeps pace with broader inflation. This is the approach of a pure DGI (dividend growth investing) follower. But I see it as buying two apples. I like variety in my fruits. So, I deviate from the DGI philosophy here. To me, it’s not so much about dividend growth but dividend orientation. Beyond dividends, I would like the companies to have diverse sources of revenues and earnings so you get to participate in the global economy in the same sector. So, instead of the AT&T and Verizon picks that most DGI investors have, I have AT&T and a different company, which I will cover here. AT&T and Verizon are largely focused on U.S. markets and they compete with each other. Both have their strengths and weaknesses and both have similar future prospects. AT&T’s bid to buy Time Warner is a step in the direction of focusing more on diversified content, but there is no guarantee the merger will go through or if the planned diversification will add value to bottom-line (data services are extremely price-competitive). Moreover, AT&T’s attempts to diversify beyond U.S. into Mexico is a welcome step in the right direction to tap into a smaller but fast-growing emerging market for wireless services. So, I chose AT&T. Based on my cost of purchase, I have a present yield on cost of 5.9% in AT&T compared to the current dividend yield of around 5%. Having selected AT&T, I did not want to load up with another major telecom giant in the same space. My view of sector diversification, even in the face of non-regular dividend income and foreign currency fluctuations, led me to Vodafone. Vodafone is a UK-based global telecom giant, with strong presence in UK, Europe, Africa and Asia. In fact, they are fast expanding and consolidating their presence in emerging markets. 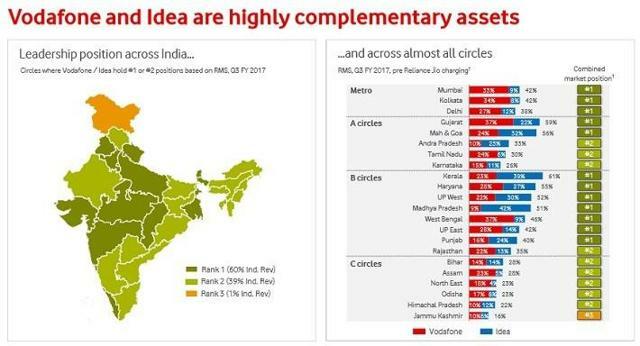 They recently bought a big Indian telecom company (Idea Cellular) – cementing their position in the second-largest and fastest-growing telecom market in the world. Vodafone has brought many innovations to emerging markets, especially in the mobile payments space. Vodafone’s M-Pesa payments platform has enabled commerce for billions of transactions. It was a brainchild of Vodafone’s Africa operations (launched in 2007 in Kenya and Tanzania) and they have now have rolled it out across several developing countries. It offers a simple, easy and cheap way for person-to-person payments. This is huge in countries where trust issues and banking deficiencies exist. The rub for U.S. investors is that Vodafone’s dividend payments are in British Pounds, don’t necessarily grow consistently, are paid only twice a year, and both dividend payments are not equal! Also with GBP taking a hit in the past year against USD (thanks to Brexit), U.S. investors would have received even less dividends in U.S. dollars compared to prior year despite Vodafone increasing their dividends in their reporting currency (GBP)! With such a ‘haphazard’ dividend payout plan, Vodafone fails the screening test of many strict dividend investors in the U.S.
To me, that is a mistake because Vodafone is strong precisely where AT&T and Verizon are weak….and vice versa. And Vodafone is conveniently traded in U.S. stock exchanges via the VOD ticker. And as per the dividend tax agreements between U.S. and U.K., American investors don’t pay taxes on the dividends from Vodafone – sweet! Vodafone’s Board seems to increase dividends only if there is clear evidence of earnings increasing, which is a prudent business practice in the hyper-competitive telecom sector. However, it can unnerve investors who want steadily increasing dividends like clockwork. Recently, with strong performance of Vodafone, there is expectation of dividends rising soon. U.S. is largely a telecom duopoly that allows AT&T and Verizon to keep growing earnings and dividends, but in the many competitive global markets Vodafone operates, this is not so easy. But the ‘quality’ of earnings is better with Vodafone mainly because they have the widest global footprint, especially among the fast-growing economies of the world. In this case, I gave revenue diversification higher importance than consistent dividend growth. This is yet another example of how you can take the best of what indexing (broad diversification) and dividend investing (high current income) offers. So, what do you think of the above approach? Share your views and let’s see how we can improve even better in the telecom sector. You can also share examples from other sectors. This seems wise. Not being too heavily weighted to the US. I also think investing in businesses that tie their dividends to performance is a smart move, because shareholders get nothing when a business goes under. I wish more US companies acted responsibly in this manner.